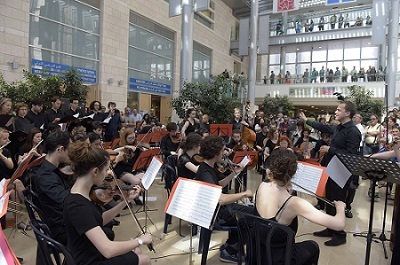 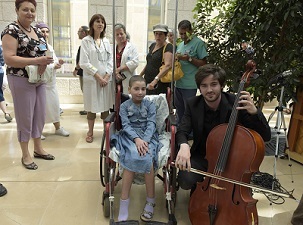 In addition to its other wonderful features, the Hadassah Medical Center’s Sarah Wetsman Davidson Hospital Tower turned out to be a magnificent concert hall, as the 80-person strong Paris Sciences and Letters Symphony Orchestra and Choir gave its debut Israel concert, made possible by Hadassah France. 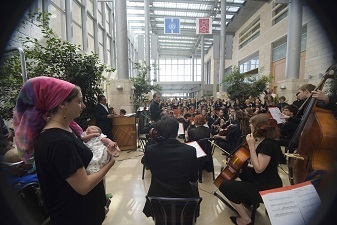 Leaving the clinics and operating rooms behind for a musical respite, doctors, nurses, and other hospital staff joined patients in pain and mothers celebrating the birth of their newborns in the Atrium of the Tower to hear Gershwin, Ravel, and Mozart. 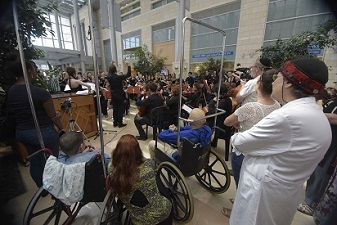 The loudest cheers came for the orchestra’s rendition of Rhapsody in Blue and selections from Porgy and Bess, including Summertime.